1996, Starring Troy Hurtubise. Directed by Peter Lynch. 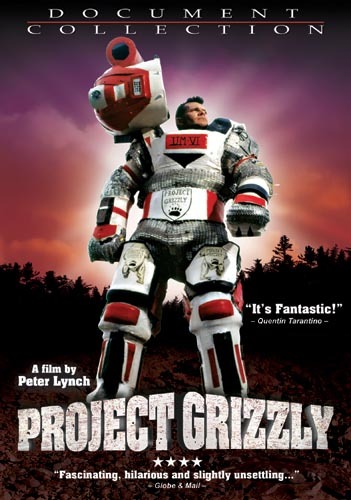 Located about three or four hours north of Toronto, North Bay, Ontario is the home of Troy Hurtubise, scrap metal merchant and leader of Project Grizzly. And this is a documentary film about him. 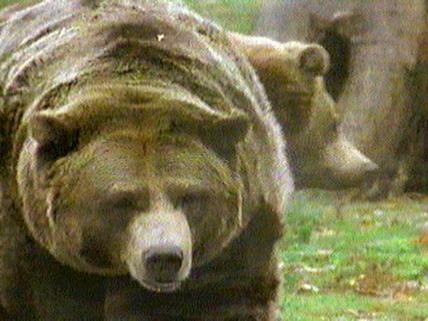 Once, Troy had a close call with a grizzly bear in the Rockies, where he was sure he was going to die. Instead, he was miraculously saved when the bear lost interest and left. The danger may be gone, but that moment sparked Troy's interest in grizzly bears and cemented his dream of being able to go head-to-head with one of these deadly beasts. As any self respecting North Bay resident knows, a grizzly bear will rip your head off without blinking. And so Troy began to work on a suit of armour to protect himself from a grizzly attack. Troy is a survivalist who loves to go on about the usefulness of bowie knives and his outdoor adventures, but this is just idle chatter until you get on the topic of the dangerous grizzly bear. 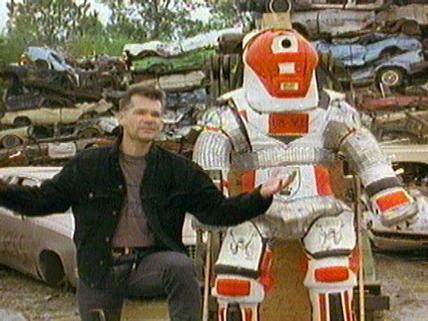 Director Peter Lynch traces the development of the Ursus Mark VI, Troy's sixth prototype bear suit. Constructed of chain-mail, titanium and heavy plastics, the red white and silver armour has to be air-lifted around, as it weighs 140 pounds. 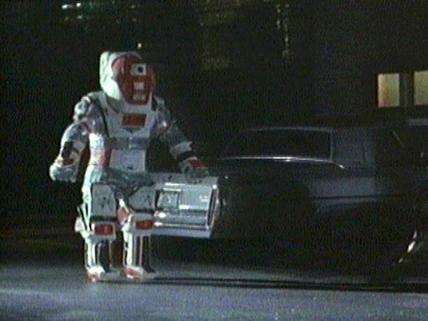 When Troy is inside the suit, he stands 7'2", and looks like a mech warrior. The first part of this film is definitely the funniest, as Troy field tests the armour. First he has a log swing down to hit him square in the chest, and then goes on to have bikers beat him with baseball bats (which break). Finally, marksmen shoot at the suit with bow and arrows and a 9mm shotgun. This may seem crazy, but is nothing compared to some older footage of Troy testing his earlier suits where he tumbles down the Niagara Escarpment and repeatedly gets hit with three-ton trucks going 50 km/h! Unfortunately, he never really gets to use the suit for it's designed purpose. After many scenes of Troy explaining the resilience of the suit, Project Grizzly goes on a five day trip to the Rockies. This is where Troy discovers that his suit is so bulky, he can't go up an incline without falling on his face, rendering the armour useless on uneven plains. But it doesn't really matter, since they don't actually see a bear until their final day. 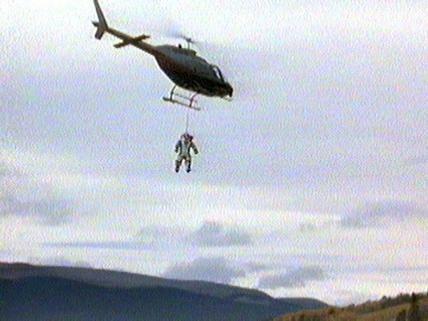 At that point, the suit has been left on top of a hill and due to it's weight, it cannot be easily fetched when the grizzly makes his appearance. This is one of those documentaries where you think the guy is crazy at the beginning, but by the end you recognize that his eccentricities are admirable. Troy even visits the town dump in order to study bears pawing through trash. Before he gets in his suit, he does a tai-chi/martial arts style warm up to mentally prepare himself. It is obvious that he is fully dedicated to his study, and that it holds some spiritual connection for him. When beginning a documentary, a director never really knows how things are going to turn out. If Troy had actually used the suit to go down and meet the bear, this film would have been a lot better, and brought the film into another sphere. As it is, Project Grizzly remains a portrait of an eccentric. And as Troy starts work on the Ursus Mark VII, you can bet a lot more people will be interested in the grizzly bear.